Book publishing as we know it began in the 1450s with the richly illustrated Bible that Johannes Gutenberg produced in Mainz, Germany, an event that soon sparked the religious revolution known as the Protestant Reformation. Many new editions of the Bible crossed my desk in the two decades I worked as the religion writer at the San Francisco Chronicle. One of the most memorable that still has an honored spot on my library shelf was a boxed, gilt-edged, 17-pound, $395 volume titled The Holy Bible with Illustrations from The Vatican Library. This gorgeous edition of the New Revised Standard Version, published in 1995, combined Old World craftsmanship and Renaissance art with the latest biblical scholarship. In more recent years, back in 2009, the crazed counterculture cartoonist R. Crumb turned his attention from the Furry Freak Brothers to Cain and Able in his illustrated edition of The Book of Genesis. 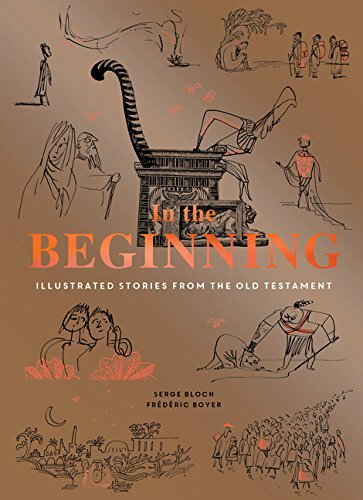 So it was with this ancient, eclectic tradition in mind that I opened the five-pound box containing In the Beginning: Illustrated Stories from the Old Testament by two Frenchmen, the illustrator Serge Bloch and writer/translator Frederic Boyer. It’s a paperback edition, beautifully packaged with a rich golden cover enlivened with a day-glow orange type, highlights and binding. Remember those thick phone books from the pre-digital days? But the illustrations and main text are anything but weighty. That doesn’t mean that the insights they inspire are not deep. From from it. There’s a lightness to Bloch’s whimsical drawings and a spare elegance to Boyer’s carefully chosen words that open up these seemingly familiar tales and give them new meaning. They have chosen 35 stories from the Hebrew Bible. Among them are Babel, or The Tale of Totalitarian Folly; Joseph in Egypt, or the Man Who Dreamed; and Sodom, or Devastating Inhospitality. At the end of the book are readings that expand in wondrous ways on the history of the interpretation of these foundational myths, drawing on sources that include ancient Jewish commentators, Pope Benedict XVI, Meister Eckhart, Kierkegaard, and Kafka. You could sit down with this cartoonish picture book and read many of these stories to your child at bedtime. And when your child falls asleep, carry this book to your easy chair, study the readings, and dream new meaning into myths you may have ignored, forgotten, rejected or never really understood. Don Lattin worked as the religion writer at the San Francisco Chronicle for 20 years.